Bundle up the kids and get ready to make some magical winter memories in Kingston! Move over, summer vacation – winter is here to steal the title of best season for fantastic family fun! Whether it’s holiday-themed entertainment, exciting outdoor attractions, or snowy thrills and chills, Kingston offers wintery weekend options that the whole family will adore. Suit up the fam in their warmest snow gear, and get ready for Kingston’s lineup of exciting outdoor winter fun! 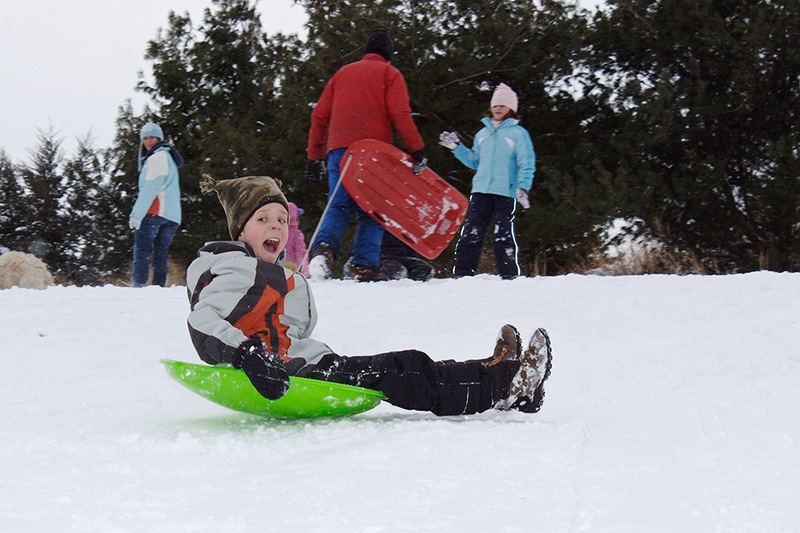 Head over to Fort Henry to spend a thrilling afternoon slipping and sliding at the sled hill (and make sure to look out for errant toboggans!). 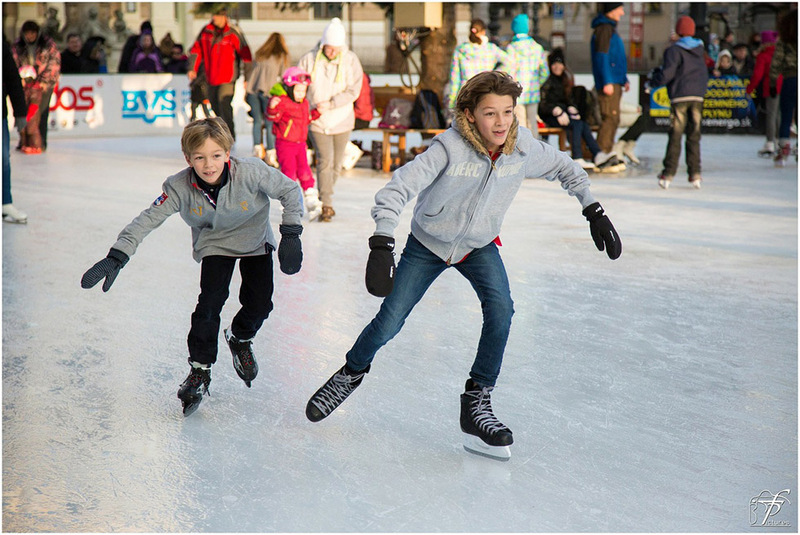 Or check out Springer Market Square, where staying upright on your skates is the challenge of the day. For a more low-key family outing, there’s Little Cataraqui Creek Conservation Area. Your clan can enjoy a frosty winter’s walk, or rent a pair of snowshoes or cross-country skis. Is it time for a family photoshoot that’s a bit more interesting than those stale mall-Santa snaps? Kingston’s got you covered with this fresh, visually-stunning winter attraction. You’ll have an amazing time watching the little ones’ reactions to the gorgeous interactive experience, and capturing their wonder in photo form. And of course, Lumina Borealis is enchanting fun for all ages, so make sure to take some time to appreciate the beauty for yourself! Finally, a cool New Year’s Eve party that the kids can take part in – only at the K-Rock Centre! The whole family is invited for a musical skate party, face-painting, crafts, a photo booth, light shows, sing-alongs, and more. At 9pm there will be a brilliant fireworks display, so make sure everyone is appropriately bundled. The best part? 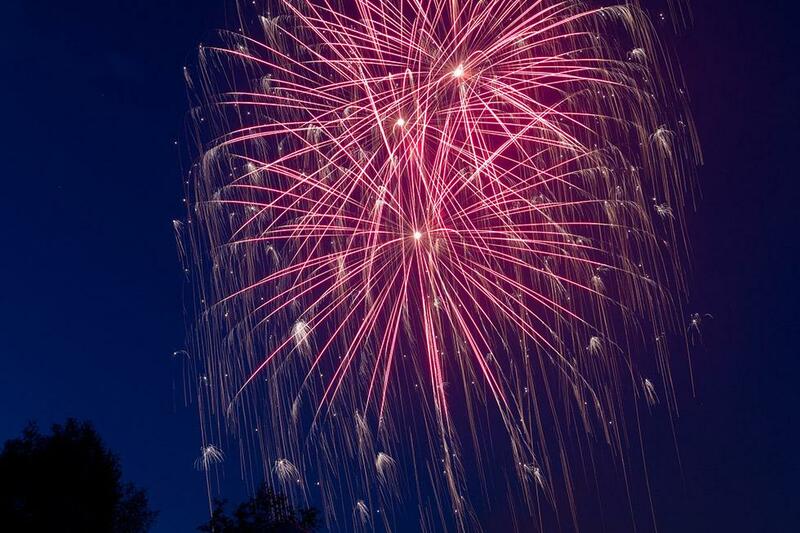 Everyone will have an amazingly fun New Year’s Eve, and you can still be home well before midnight (whew!). More information on the City of Kingston website. It may be a dreary and chilly month, but in Kingston, February is something to look forward to all year! Feb Fest will once again be heating up downtown Kingston with a flurry of fantastic fun. Figure skating fans will be dazzled at the Imagination on Ice figure skating show, and can then try their own fancy ice tricks at public skating. If your kids are into hockey, they’ll be psyched for the Carr-Harris Cup and Hockey Day in Kingston. And make sure to check out the Winter Fun Zone, which will have something cool for everyone! More information can be found in January on the Downtown Kingston website. Regardless of how you decide to spend your wintery weekend, one thing is certain: when it’s over you’ll all be ready for a cozy dinner at one of Kingston’s great family-friendly restaurants. Woodenheads Gourmet Pizza and Pan Chancho are just two options that offer delicious bites the little ones will love.